After receiving a wave of petitions from various citizens of Barmenian over the issue of the current war between the nations of Zardugal and Cobura, the Madjlis (Assembly) has decided to announce the government's position on the war and the actions the government shall take. The national government of the Krsyiji Brmék Onsmifrndé Knstat has decided that Zardugal's acts of imperialism are reprehensible. Due this decision, the national government has decided to cut off diplomatic ties with Zardugal. Furthermore, a petition has been swirling around over the past few months within the military and various veterans organizations calling for the formation of a volunteer force to be sent to the nation of Cobura. The government has decided to heed these requests and has decided to sponsor this force. Thus, the government has decided to formally establish the 1st Red Volunteer Brigade, which shall consist of 3,523 volunteer soldiers from the Barmenian military. This volunteer force shall also be backed by a direct contribution to the war effort worth 10,000,000,000 BAR. Should these be accepted, the Brigade shall be put under the direct control of Cobura's military to ensure maximum efficiency in the war and with the expectation that the funds shall be used for the war directly. International observers: PDRJ elections "free but not entirely fair"
The Barmenistani interim government has collapsed with many Ministers believed to be trapped in government offices in the capital Sekhmet. The fall comes after two years of public protests against a sharp economic downturn and perhaps more crucially, the ongoing mutiny in the lower ranks of the Army. The mutinying troops under Maj. Gen. Levon Tawaryan appear to be in control of the areas around the capital and the rest of the Army appear less than resistant having endured four months without pay under the dysfunctional interim government. The previously little known Tawaryan has declared himself Interim President and is now involved in the delicate negotiations of getting the rest of the security forces behind him. In a series of apparently spontaneous protests, tens of thousands of Barmenistani youth have endorsed the so called "Social Revolution" and pledged support to the country's new government. Barmenia's new leader Levon Tawaryan has proclaimed a "Cleansing Period". The development came following the Government's revelation of a failed assassination attempt on him. Four junior officers tried to kill him during a military parade in Sekhmet. Upon "sharp questioning", the four all revealed that they were part of a wider "counter-revolutionary" conspiracy aimed at reversing the Social Revolution to the benefit of what Tawaryan called, "foreign powers, traitors, domestic vulture capitalist leeches and other filth." The Government has declared a state of emergency over the entire country and boosted the power and capacities of the security forces in order to carry out the so-called Cleansing Project. Civil society organisations have expressed concern over the latest developments and have called on the Government to minimise any effect of this new process on Barmenistani civil liberties. Tawaryan's Barmenistani Social Nationalist Party has won all of the seats in the new legislature, the Revolutionary Command Council. The party ran mostly uncontested, the few opposition candidates who registered to run, generally dropped out due to what one claimed to be "violent persuasion by regime supporters". The Information Ministry rejected allegations of coerced withdrawals as "counterrevolutionary propaganda." The newly elected legislature has dived into its work enthusiastically - it has conferred the ancient title of Shfet (Shophet) to Interim President Levon Tawaryan. The title which translates to "judge" originates from the Qedarite (OOC: Phoenician) colonial era. The RCC has also affirmed its intention to follow through with the party's ambitious "Social Economy" plans which economists have described as a "Kodonist hodgepodge of public investment, industrial protection and populist spending splurges." Shophet Levon Tawaryan has effusively praised the People's Revolutionary Tribunals for their "hard and unrelenting work" The Shophet spoke at his BSNP's second party Congress where he addressed hundreds of delegates on the progress of the Social Revolution. It is close to two years since the Social Revolution began. I want to take this moment to salute all of our comrades serving on the People's Revolutionary Tribunals. You started your work immediately after the revolution and have only been formalised of late by the Revolutionary Commanf Council. You have cleansed the country of tens of thousands of counterrevolutionaries, traitors and foreign spies. Statistics from the Ministry of Justice show that you have sent 16,343 of these to the gallows and 73,121 to prison. Your speed and efficiency are to be commended. It is only once the nation is cleansed of treachery that the revolution can fire ahead. The hallmark of a great justice system is speed and fairness. Bravo! Non-governmental organisations such as the Barmenistani Lawyers for Human Rights have claimed that the actual figures for executions may be as high as 50,000 while as many 200,000 have been imprisoned. The Government has rejected these allegations and has warned civil society groups to "stop spreading fake news". Following several weeks of controversy over human rights protection in the country, the Ministry of the Interior has announced increased registration fees and new regulations for non-governmental organisations. Domestic NGOs will need to pay an annual registration fee of 500,000 LOD up from 1,500 LOD. Foreign NGOs will have to fork out roughly 1.4 million LOD, up from 6,500 LOD.NGOs which "serve to further revolutionary and patriotic causes" will be exempt from the hiked fees. Civil society organisations have condemned the hike and it is expected that some 98% of all NGOs in the country will close down by the end of the year. Sixty four lawyers associated with the Lawyers for Human Rights NGO have been hanged after being convicted of spying for Vanuku. The lawyers were tried in a Popular Revolutionary Tribunal in central Sekhmet and constituted some 80% of the 81 membered NGO. The lawyers had been accused of spying on military installations in the country under the guse if data collection for their NGO. Shophet Levon Tawaryan praised the decision and commended the Tribunal for its patriotism. He also urged other revolutionaries to remain on their guard and punish criminals without mercy. The Social Nationalist regime has met its first hiccup in its drive towards what World Assembly President Ibrahim El Salefi described as "supreme dominance." The newly launched Land Campaign is meant to seize all privately owned land and redistribute it in the form of self-sufficient agricultural communes. It has met a great deal of resistance in the first national test site for the project, from highland peasants in north-eastern Barmenia. The peasants have refused to follow orders to hand over their land to government officials and be transported to their assigned state-owned communes. They say that they feel only wealthy landowners have anything to give and they are naturally reluctant to leave their homes and the graves of their families, among other things. 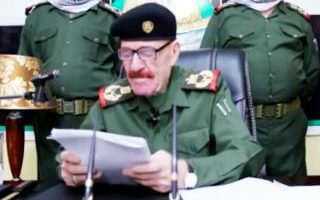 The man in charge of the campaign, the regime's number two man, Finance Minister and Second Secretary of the ruling party, Bhjtar Jrka condemned the peasants for what he called "radical Ahmadist sabotage" and has vowed to "make them bow to the Revolution." The peasants are mostly Ahmadis of a conservative bent and are thought to be encouraged in their resistance by the local Ahmadi shfets and perhaps national leaders like the Grand Mufti of Sekhmet. Peasants Declared "Radical Ahmadist Saboteurs"
There have been reports that the Popular Army has "cut off" the rural communities of Qardajar, Murdhe. Military and paramilitary units have been deployed around the settlements and nothing is allowed to go in or leave the villages. The peasants of Qardajar have gained notoriety for resisting the Government's land reform program. Several Government officials denounced the peasants as "Ahmadist saboteurs, spies and traitors". This prompted a Popular Revolutionary Court in Qardajar City to try the peasants (thought to be somewhere between 12 and 15,000 in number) en masse. The verdict was unanimous - the peasants were found to be Vanukuian agents and declared to be reactionaries. The tribunal sentenced them to "whatever punishment the Party and Government sees fit. Shophet Levon Tawaryan has announced that his Government is working on reaching the goal of a million man army by 4495. The Shophet said that the rise of fascism in Vanuku was an existential threat to Barmenistan. He also noted that a number of "reactionary states" had also made threats towards the Social Republic. Already the Popular Army has been expanded considerably with the introduction of three year conscription and defence spending was nearly doubled in the first post-revolution budget. It is difficult to calculate the size of the Barmenistani army. This is due in part to government secrecy and also the number of unofficial "party militias" of unknown size. It has been estimated that as many as fifty thousand men and women may serve in these militias, the most notable of which is the Martyrs of the Revolution. Some sources have made wild estimates, one putting the total force at between 250,000 and 350,000 men.